What should I wear/bring to my sessions? Are any of your services covered under OHIP? Can you bill directly to my insurance company? You can make an appointment by either calling us at 613-727-0044 or by requesting an appointment online (in this case, we will call you promptly to schedule an appointment). You can book your subsequent visits before you leave the clinic after your session. You do not need a doctor’s referral for any of our services. However, a number of extended health benefit plans may require a doctor’s referral to process your claim. Yes, all our health care professionals are fully licensed and board certified by their provincial and national governing bodies. At your first visit it is important to arrive about 5-10 minutes early, as you will be asked to complete basic information papers as well as standardized forms to help us understand your current injury. You will then be seen by your registered health care professional who will complete a thorough evaluation of your conditions/injury and educate you on the findings. The session will end with a treatment that will be based on your injury. Your health care provider will then discuss with you recommendations for future sessions. The initial appointment can last approximately one hour. Subsequent treatment sessions typically last 30 to 60 minutes per visit. For information concerning our massage therapy sessions and/or appointments with our social worker, please contact us directly. There is no fix number of treatments for any conditions. The frequency and length of your treatment sessions will depend on several factors, including the nature and severity of your injury. During your first appointment, your health care provider will discuss a treatment plan with you with recommendations on the frequency and duration of your treatments. What should I wear/bring to my session? If you are attending for a lower back or leg injury, shorts will make your assessments and treatments more comfortable. If you are attending for an upper body injury, short-sleeved shirts are recommended. Please bring with you any doctor’s referral, should you have one, so we can make a copy for our records. Unfortunately physiotherapy is no longer covered under OHIP, except for specific circumstances. 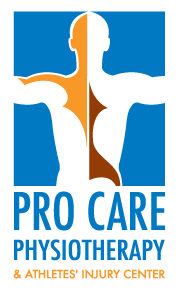 However, Pro Care Physiotherapy & Athletes Injury Center offers services, which are covered by most extended health care plans. You can contact your extended health care insurance to determine your level of coverage. At this time most extended health insurance companies do not accept direct billing from physiotherapy clinics. We take payment upon each visit and provide you with an official receipt, which you can claim through your insurance company. We are only able to bill directly for approved Motor Vehicle Accident claims, and for other specific insurance companies. Please contact us for more details.